SAN FRANCISCO (Jan. 16, 2015) — A San Francisco Superior Court judge has found that the Accrediting Commission for Community and Junior Colleges engaged in “significant unlawful practices” in reaching its controversial 2013 decision to terminate City College of San Francisco’s accreditation, according to a tentative ruling issued this morning. If finalized as expected, a significant feature of Judge Curtis E.A. Karnow’s 72-page proposed decision would offer the college of some 80,000 students a new option to pursue to secure its accreditation and finally put threats of closure to rest. 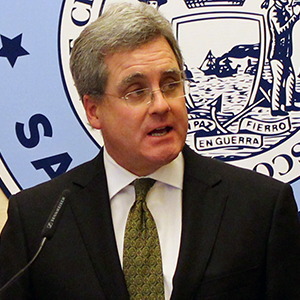 Herrera at the Jan. 16, 2015 news conference on the trial court ruling in People v. ACCJCKarnow’s proposed injunction would require a full, fair reconsideration of City College by the Novato, Calif.-based accrediting panel, assuring due process rights that Karnow found accreditors denied the college in 2013. Karnow’s injunction would require accreditors to rectify multiple deficiencies in their 2013 evaluation by engaging in a thorough reconsideration process, while prohibiting ACCJC from taking any action to finalize a termination decision until the process is complete. Karnow directed City Attorney Dennis Herrera’s office to take the lead in drafting a detailed injunction that reflects the terms outlined by Karnow. ACCJC will be entitled to make objections to the injunction, but Karnow himself would make all final decisions on the court order. The contemplated injunction would allow City College to opt into a reconsideration process issued by the court, or opt out of the process by continuing with the “restoration process” accreditors created and approved for City College for yesterday.